The Remains of Villages on Nozaki Island are one of the four components demonstrating to which locations the Hidden Christians migrated to maintain their religious communities. Before some of the Hidden Christians from Sotome migrated to Nozaki Island, the island’s only inhabitants were Shinto priests of Okinokojima Shrine and their followers. 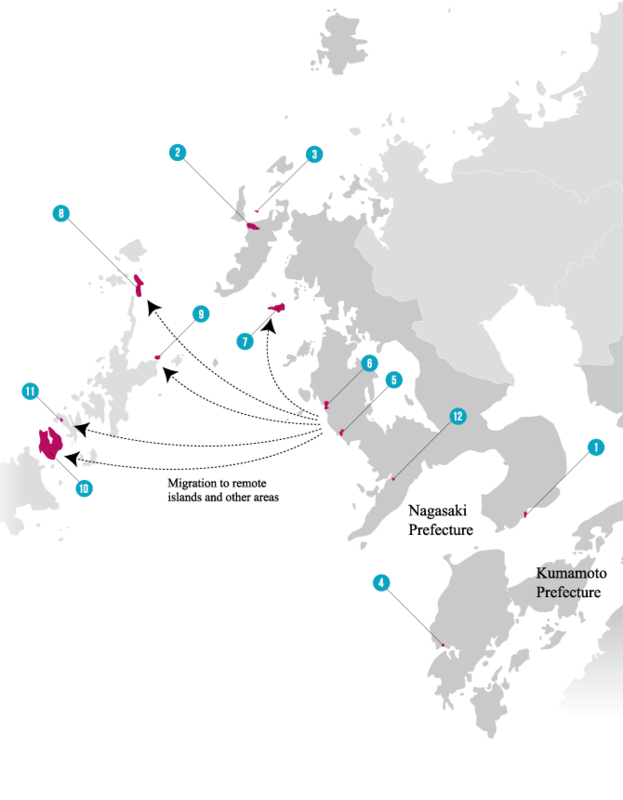 The migrants selected the island so that they could maintain their religious communities in secret while affiliating themselves with the Shinto shrine and outwardly behaving as its followers to camouflage their inner faith. The Hidden Christians on the island rejoined the Catholic Church after the lifting of the ban on Christianity and constructed new churches in two Christian villages in the central part and the southern part of the island, marking the end of the Hidden Christians’ hiding. 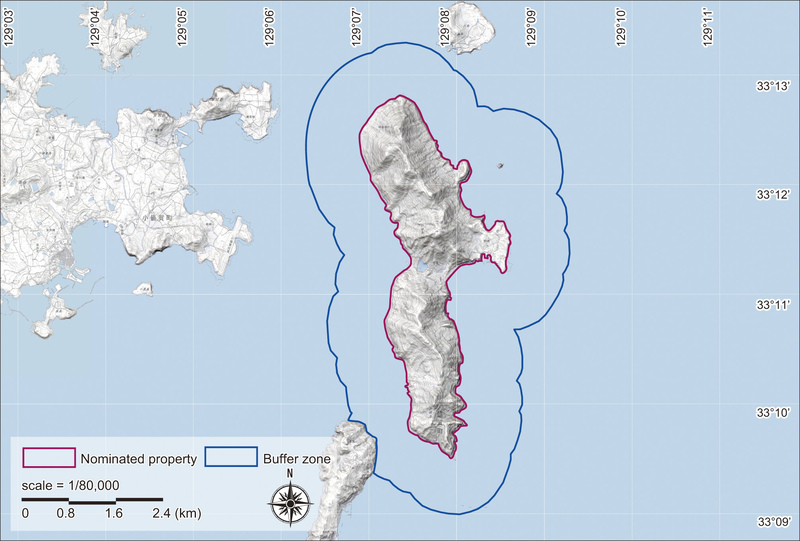 Nozaki Island is a long narrow island, extending 6 km from north to south and 1.5 km east to west, located in the northern part of the Goto Islands territory. It consists of steeply sloping terrain surrounded by cliffs, except for some gentle slopes in the central part of the island. The island includes the Okinokojima Shrine with which the Hidden Christians were outwardly affiliated in order to hide their secret faith, the residence of the Shinto priests who managed the shrine, the sites of farmlands and houses made by Hidden Christian migrants. The sites of leaders’ houses and graveyards of Hidden Christian communities as well as the sites of churches constructed after the lifting of the ban also remain on the island. The Okinokojima Shrine is situated in the northern part of the island. Behind the shrine, there is a formation of two volcanic stone pillars (24 m in height and 12 m in width), topped by a huge stone called the Oeishi (5.3 m in length, and 3 m in width and 1.2 m in height). Since ancient times, the shrine and the Oeishi have been venerated as the seat of a guardian deity of maritime safety by Shinto practitioners throughout the Goto Islands. Since Nozaki Island was considered such a sacred place for Shinto practitioners, there were hardly any settlements established there. As the island is small with precipitous cliffs extending along most of its shoreline, human settlement only occurred in the Nozaki area on the eastern coast of the central part until the 19th century. About twenty houses and the residence of Shinto priests were built there. The Shinto priests were also appointed as administrative officials by the Hirado clan, and had ruled the entire island. According to the records kept in the shrine, the number of households on the island doubled in the middle of the 19th century. This attests to the migration of Hidden Christians to the island during those years. The Hidden Christians who migrated to the island in the 19th century outwardly followed the practices of the Okinokojima Shrine and participated in Shinto rituals. They were also affiliated with a Buddhist temple on Ojika Island. They regularly attended the Efumi ceremony and concealed their secret faith as Hidden Christians by trampling on an image of Christ or the Virgin Mary. 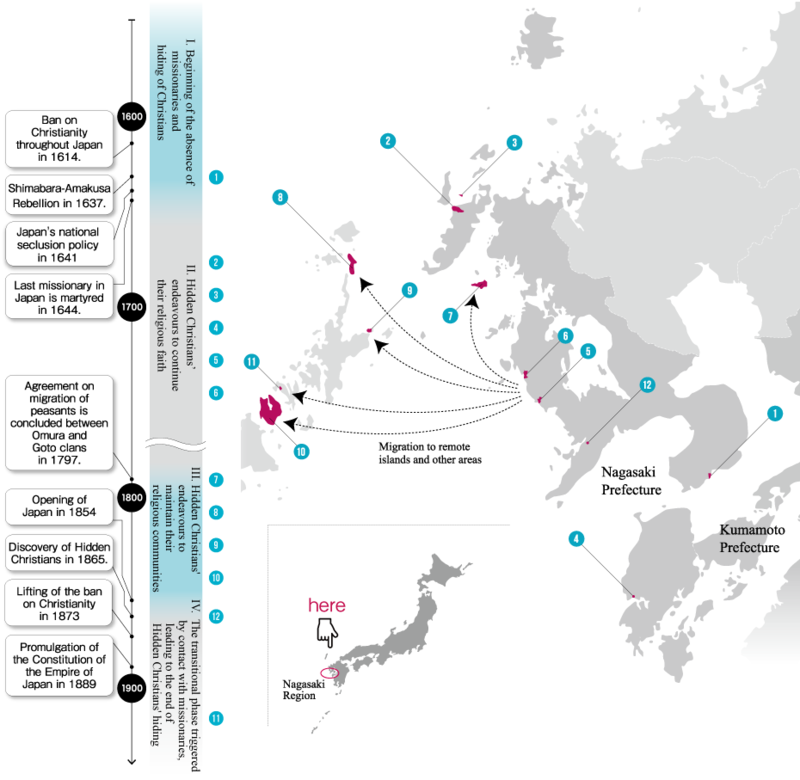 The Hidden Christians migrated to the Nokubi area in the central part of the island (establishing Nokubi Village), as well as to the Funamori area at the southern tip of the island (establishing Funamori Village); neither area had been inhabited prior to the migration. The Hidden Christians were not allowed to collect wood, but they managed to make the steep difficult slopes usable, developing narrow plots of flat land by building stone retaining walls for residential space and cultivation, and creating plots which to grow potatoes and wheat. Hidden Christians continued their religious faith under the guidance of their own leaders such as Chokata and Mizukata, while outwardly observing rituals of traditional religions. Following the Discovery of Hidden Christians at Oura Cathedral in 1865, Hidden Christian leaders in the communities scattered throughout the Nagasaki region secretly started contacting the European missionaries at the cathedral. Hidden Christians on Nozaki Island also contacted the missionaries, and it is recorded that five Hidden Christians of Nokubi Village including leaders and other members visited Oura Cathedral in 1865 to receive baptism. However, starting in 1868, a new wave of persecution swept the Goto Islands, and some of the Hidden Christians on Nozaki Island were arrested and detained on Hirado Island. 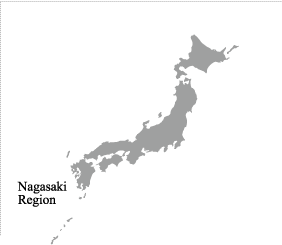 Eventually, the ban on Christianity was lifted in 1873, and all of the Hidden Christians on Nozaki Island joined the Catholic Church as their ancestors did in the 16th century. They initially used the houses of former Hidden Christian leaders as temporary churches for their rituals, but later constructed wooden churches in 1881 in Funamori Village (Setowaki Church) and in 1882 in Nokubi Village (Nokubi Church). These churches symbolically marked the end of Hidden Christians’ hiding on Nozaki Island. In Nokubi Village, the present church (the Former Nokubi Church) was built in 1908 beside the house of a former Hidden Christian leader (Chokata). Although only the site of the Setowaki Church in Funamori Village still remains, after all the villagers moved out en masse in 1966 due to depopulation, its parish house was moved to Ojika Island and is still in use there.